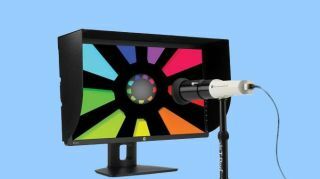 Most of us toil away on a computer display capable of showing only a fraction of the color detail being thrown onto it, but two new offerings introduced by HP promise to bring out all the colors of the rainbow, without breaking your budget. HP has announced two new pro-level computer monitors for Windows, Mac and Linux users, each capable of displaying up to 1.07 billion colors on screen with an error rate lower than what the human eye is actually capable of seeing. According to HP, the new DreamColor Z27x and Z24x feature 60% more pixels while being capable of displaying a color palette of up to 4,000% higher, all while reducing the thickness of the displays by as much as 57%. Priced at US$599 (about AU$646), the entry-level Z24x costs 25% less than its predecessor and features a 10-bit accuracy, one-button access to a full range of built-in presets and easy connectivity to desktop and laptop systems. At the higher end of the scale, the HP Z27x introduces built-in support for third-party measurement hardware with remote management via Ethernet and a full software development kit (SDK) for software integration. Going for US$1,499 (about AU$1,617), HP claims the Z27x offers three times the color accuracy of its previous generation 27-inch display, making it the most affordable color-critical display on the market capable of 4K resolution. As part of an ongoing "technology collaboration" with DreamWorks Animation SKG and other leading Hollywood studios, the HP Z27x has been built from the ground up for content creators ranging from film and video post-production to product design, animation, graphic arts and photography. HP also announced a pair of real-time collaboration tools today for its HP Z Workstations with 256GB or 512GB PCIe-based solid-state drive (SSD) storage as well as updated HP Remote Graphics Software 7.0, which debut in May and June, respectively. Discover the 10 best tablets of the year in our exhaustive report!